Three looks, one pair of booties. work look: Gentle Fawn top c/o. Old Navy jeans. UO boots. Madewell bag. weekend look: Gypsy05 cardigan c/o. Somedays Lovin dress. UO boots. going out look: thrifted Levi's jacket. PacSun romper. Lulu*s hat c/o. UO boots. I partnered with RetailMeNot to create three looks (work, weekend, and going out) showcasing an essential Fall trend - the must-have booties. But the challenge was to purchase the clothes and the boots for my looks using RetailMeNot coupons with every purchase AND staying within a budget of $150...eek. Luckily, RetailMeNot is a blessing for looking good on a budget. Through much sleuthing and couponing, I was able to find three essential pieces for each outfit to go with these amazing Urban Outfitters boots that I snagged for 10% off using the coupon KoolSkool. They are the perfect cutout boots made in collaboration with Dolce Vita; I instantly knew the rich brown, ankle-grazing boot would be beautiful and functional enough to wear for Fall days and nights. As a fan of their simple and soft tees, I know you can find some of the best stuff at Old Navy if you just look carefully. The next thing I wanted to try from them was their extensive line of denims, so I picked up these skinny black jeans to go with my casual work look. While they were originally $34.50, they were on sale for $19 and with a cool 20% coupon (ONSAVENOW), I got them for $15.20. $15 pair of brand new jeans! And they are so comfortable and fitted - I highly suggest trying them out at such a low price! For my weekend and going out look, I knew just the place to find the easy, breezy styles I covet for down time – PacSun. Armed with a 20% off $75 coupon (RetailMeNot2075) and a lucky online promotion of 30% off dresses and rompers, I got an checkered sundress dress from favorite label Somedays Lovin for just $41.99 and a cute black romper for $16.52. 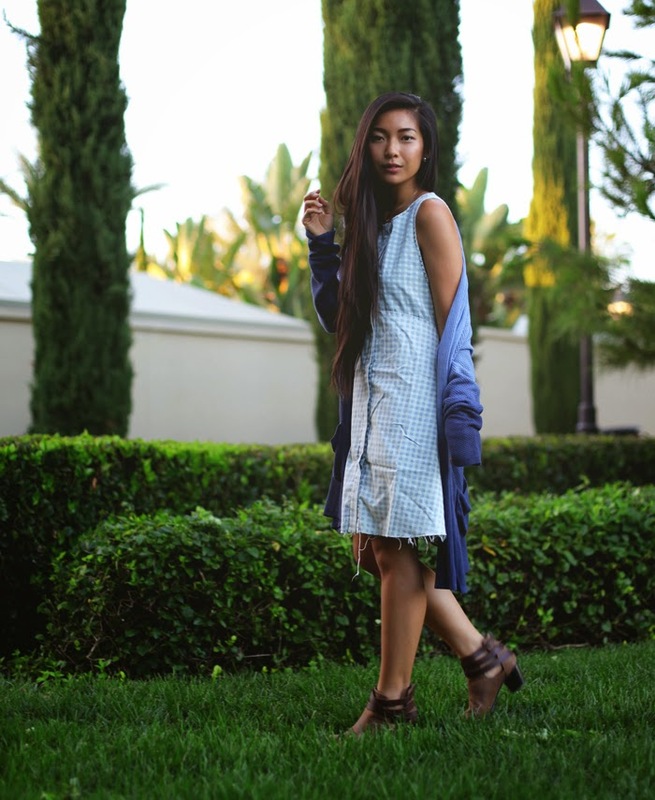 The Somedays Lovin sundress is so adorable and perfect for laying out on the grass and taking my Sunday park naps with Kyle, so I paired it with my fave cozy cardigan from Gypsy05 for a cool afternoon. I wore the romper for a laidback bar night because I just think rompers are so cute and hassle-free for going out. There's no fuss and all fun! In total, thanks to RetailMeNot, I spent $147 and saved $87.82 for basically three outfits and a rad pair of shoes! Not going to lie, this may have definitely gotten me into the coupon craze. If you're an avid online shopper like me, don't forget to always check for coupons on RetailMeNot first before you check out! Check out more of my looks and other participants of the Fall Fashion Challenge on RetailMeNot's The Real Deal. loving your first outfit - that blouse is gorg! Love all these looks, especially the third! I love how neutral booties are so versatile! Thanks Sara. Yup they are just essential aren't they? you look gorgeous love! We love all 3 looks!